The building blocks of proteins are called amino acids. There are 20 types of amino acids; some can be made by our body and some cannot. It is crucial to include the nine types of amino acids that cannot be made by our body (also called essential amino acids) in our everyday diet. Protein sources are labeled based off of how many of these essential amino acids they provide. 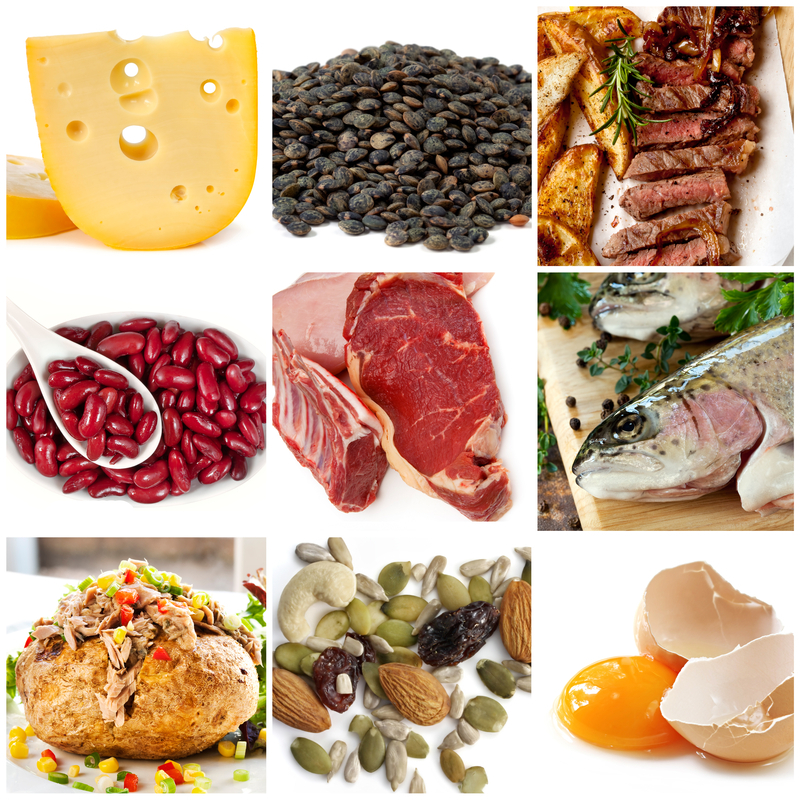 A complete protein (also known as a high-quality protein) provides all of these 9 essential amino acids (“Protein”). We need to eat protein on a daily basis to make sure that we have enough for the growth and repair of cells in our bodies. Having enough protein is especially important during the rapid growth times of childhood, puberty and pregnancy. Protein can also help keep us full for a longer time since it digests very slowly, helping with weight loss to some extent. That is why it’s recommended to have a source of protein with every meal (“Protein in Diet”). Protein can come from both animal and plant sources. Generally, the proteins that come from animal sources are considered complete/high-quality proteins. Some common examples are: milk, cheese, eggs, fish, poultry, and meat. In contrast, the proteins from vegetarian sources are generally low in some essential amino acids and are therefore considered incomplete proteins. As a result, we have to combine two complementary sources of vegetarian protein to make sure our body gets all the essential amino acids and that they can be effectively used by our bodies. For example, legumes/beans/nuts/nut butters are low in a few essential amino acids, and rice/wheat is low in different essential amino acids. But eaten together, they complement each other and make a complete protein meal. Some examples of complementary sources of protein meals are: a peanut butter sandwich, pita bread and hummus, a chapatti with lentils, or soup with pasta and beans in it. Earlier, it was thought that one had to eat both complementary sources together in the same meal for them to be effective, but newer research has shown that as long as they are eaten within the same day it is still acceptable (“Protein”). It is important to note that there are a few vegetarian complete protein sources such as quinoa, amaranth, buckwheat, hempseed, chia seeds, and tofu. Check out some of the recipes using quinoa here! Unlike with fats and carbohydrates, our bodies do not store proteins. As a result, we need to eat protein on a daily basis to meet our requirements. But we must not overdo it either; more protein does not equal more muscle. In fact, a diet too high in protein can result in high cholesterol or gout and may even affect the kidneys. A person’s protein requirement will depend upon their age and health status, but generally, 3-4 servings of protein-rich foods will meet the daily requirements for most adults (“Protein”). Here is one simple tip to increase protein consumption, given to me by my personal trainer Allison: Eat a banana by just dipping in 1T of chia seeds (or sprinkle them over a bowl of yogurt) for a perfect pre or post workout snack. Children ages 1-3 13 gm. Children ages 4-8 19 gm. Children ages 9-13 34 gm. Girls ages 14-18 46 gm. Boys ages 14-18 52 gm. Osterweil, Neil. “The Benefits of Protein.” Men’s Health. WebMD, n.d. Web. 19 May 2014. “Protein in Diet.” MedlinePlus. U.S. National Library of Medicine, 5 May 2011. Web. 19 May 2014. “Protein.” Nutrition for Everyone. Centers for Disease Control and Prevention, 04 Oct. 2012. Web. 18 May 2014. I don’t understand the reason why I cannot join it. Is there anybody having the same RSS issues? a great author.I will be sure to bookmark your blog and may come back later on. I want to encourage one to continue your great posts, have a nice day!